W.Bro. Dr.Vattacherril Joseph Thomas was initiated into the mysteries and privileges of Freemasonry in Lodge Trivandrum on the 16th of March 1996. He was passed and raised on 4th August 1996 and 12th October 1996 respectively. W.Bro. V. J. Thomas has held various offices in the Lodge and was elected to the Eastern Chair while he was serving the Lodge as it Senior Warden. Bro.Thomas was Installed as the 42nd Master of Lodge Trivandrum on the 24th of January 2006. W.Bro. Dr. V. J. Thomas is also a member of Chapter Thirivananthapuram. W.Bro. Thomas was born on the 19th January 1945 in the ancient family of Vattacherril. He had his early education in Trivandrum. From the high school classes to his M. B. B. S Degree Bro. Thomas was the recipient of the National Merit Scholarship. While in his final year M. B. B. S, he was commissioned in the Armed Forces Medical Service. He joined active military service on completion of the course and was seconded to Indian Air Force. He served the Air Force for five years and was holding the rank of Flight Lieutenant. 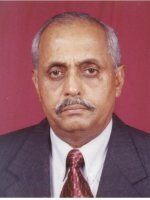 He served a brief period in the Trivandrum Medical College as tutor and then as Medical officer of Malayalam Plantations, and The Aluminum Industries Ltd. W.Bro. Dr. Thomas then went abroad to take up the assignment as the General Duty Medical Officer of the Secretariat of Health, Yefran, Libia. On his return he worked for Harrisons Malayalam plantations and the Travancore Titanium Products. He is presently Medical Consultant for Hindustan Latex - a leading Public Sector Undertaking. W.Bro. Dr. V. J. Thomas is a keen sportsman. He has represented the college in Hockey, Tennis, Badminton and Athletics. He was the General Captain of the Trivandrum Medical College. He is a keen Golfer and has won several tournaments in and out of the State. He is the Captain of the Trivandrum Golf Club. W.Bro. Dr. Thomas is a member of Indian Medical Association, College of General Practitioners of India, Ex-Service Officers' Association, Trivandrum Golf Club, The Addicts Golfing Society of Southern India, Officers Institute (Defense) Trivandrum and Trivandrum Tennis Club. W.Bro. Dr. V.J.THomas is married to Smt. SobhanThomas, a Post Graduate in Microbiology. They have two daughters, married and well settled.